Vitamin K is an essential element to keep the body good health and optimal system functions. The presence of this fat soluble vitamin – helpful to clot blood and give strength to the bones – can also prevent the mistakenly clotting of a functioning vessel and arterial calcification. Furthermore, this vitamin helps in the balance of blood pressure and gives protection against any heart problems. Deficiency of this element is very rare since vitamin K is found abundantly in leafy green vegetables and some green spices and, in addition, it is produced by some bacteria present in the intestines. It is recommendable to avoid taking antibiotics much frequently, since the components of them would eliminate any bacteria – good or bad – including those that produce vitamin K. Besides, antibiotics can lead to obesity and slow mental condition. •	Improper condition that does not allow the correct absorption of fat. •	Followers of diets which absolutely lack vitamin K.
•	Problems in the intestines of biliary tract. •	Intestines partial surgical removal. 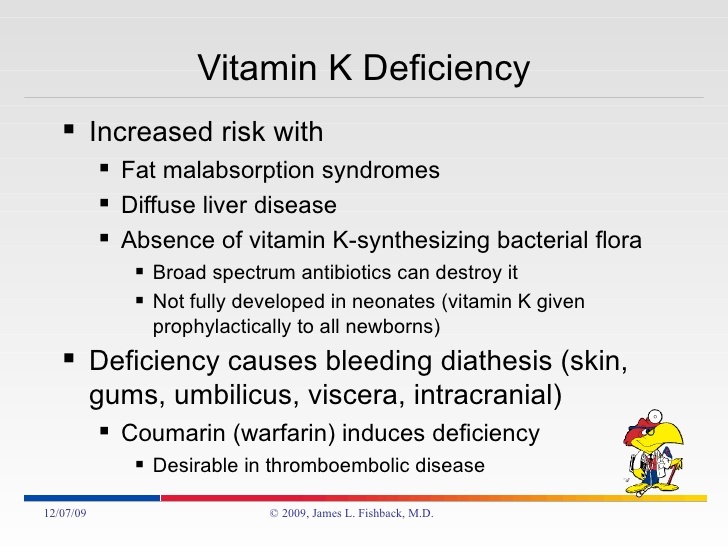 The essential role of vitamin K in blood coagulation is an important function of the substance; so low levels of the element in the system would reflect in the impossibility to stop excessive blood run when a slight injury or wound takes place. The lacking of this vitamin is the origin of anemia and one of the well-known effects of this illness is a sense of weakness at any time. Vitamin k is a good controller of digestion and it enables the smooth functioning of the digestive system. Lacking this element generates stomach aches that can be hard to cope. The low levels of vitamin K close associated with blood and coagulation can generate bleeding through the nose more often than with other diseases. Although, there is no a stablished amount of vitamin K daily consumption, some nutritionists say that it is advisable to take 120 mg for men and 90 mg for women; this can be done by eating food like leafy green vegetables, spring onions, beans, and prunes. Whether suffering for fat malabsorption or not, it is preferable to visit a physician at the very moment of showing any of the symptoms and signs described above to start treatment immediately.